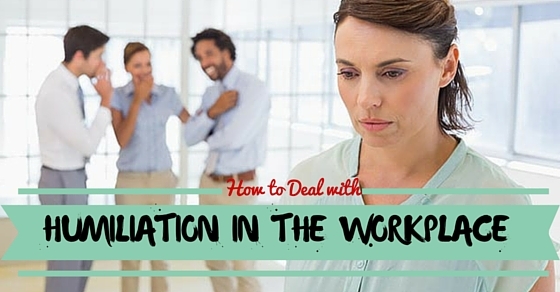 How to Deal with Humiliation in the Workplace? Humiliation can be defined as an action of dishonor, embarrassment, or causing shame to a person. Humiliating hurts a person very deeply, and it affects a person mentally. Workplace bullying has become very common. Bullying in the workplace causes humiliation and it becomes very tough to overcome in a work atmosphere. An employee gets humiliated when someone hurts his/her ego. For example, when a person makes fun of others lifestyle or makes fun of other ideas, it might cause humiliation to the individual. There are times when humiliation occurs when a person does not do his/her duties in their job or any kind of personal vengeance. This is not the right way to punish an employee’s act at all. This causes so much humiliation to the employee which makes them more stressful. Here are some useful tips and tricks to survive in the working environment without being humiliated in some bad times and some motivation to get back to the track. How to Deal With Insults & Humiliation at Work? The following mentioned are a few tips to manage bullying and harassment at work. It is natural to lose your cool when someone humiliates by relevant talks. And by heat of the moment, we tend to argue for silly behaviours. This act of anger will not help to subside the issue, rather it only increases the trouble. So it is always important to keep quiet and stay cool. It might sound tough to be patient in these kinds of situations. But anger increases the trouble and lets our image more down in the workplace. When someone calls you for an argument, think twice before you speak. There are few things you should keep in mind before proceeding. They are, think twice whether you need to give an answer to the person. Make a self-analyze about how important the person is for you in the office. This will help to not lose your image if he is holding a superior position to you. And avoid looking at the eyes or avoid completely looking at them to not lose patience. Spilling words is easier and it makes you calm once you blast, but the real scenario is you lose when you show you have become ferocious and have got humiliated. It is totally advisable to leave the place, where humiliation takes place. This is because you do not have to give a chance to humiliate you more by standing there. This will help you personally not to get hurt as well as it will save you from further inviting troubles or a heated argument. This does not mean you are weak, so you left the lace. It means gentle enough to save you from getting humiliated. Almost everyone might have faced lot many criticisms across our entire life. Like for example, from school, we might have faced humiliations. Those days that were not considered as a big issue as it very kiddish. Apply the same kind of scenario in your work environment. When you are been humiliated in office, never take it too personal or something which depresses you mentally. Treat it as a petty issue and put your imaginative mode on that person. You can imagine them as a school kid, or a barking dog for that matter. This will eventually reduce your stress and give you a free mind. You can follow this trick confidently, it is appreciated by lot many psychologists around the world. Avoiding humiliations is a good way to have a healthy environment in the workplace. But, facing the issues can also be dealt if you have to do it in extreme cases. Shying away or avoiding when it is beyond limits is not a solution. Confronting the problem is also a good way. Stand up and put your views in a cool way instead of running away. By this, it will help you not to become a target or it will improvise your self-image. It is common, people in the workplace will try to humiliate you using harsh words. In those kind of pressurizing situations try to control your anger, and be very controlled. Do not use inappropriate words on them because they do not have a standard and we have a standard. In order to avoid heated arguments, do not reply to them. This is the best tactics to avoid controversies and it will, in turn, take care of your reputation too. When things are beyond control, it is advisable not to hide it from superiors. You can wait for sometime and see if things are getting better. If this is not the case, try to write an email or meet the higher authorities to speak about it. End of the day, when you could not withstand the humiliation, you have to take it to the superiors. It Is always better to keep it on their notice. Humiliation is not only by words. Sometimes it goes to the next level using the body language, facial expressions, or dishonouring physical looks. This might be something more than harassment. In this kind of situations do not worry too much about your environment. Try to bring it all to employee’s attention in the workplace. By doing this way, the concerned person might get scared to repeat it ever. Most people at least once in their lifetime must have undergone humiliation and it is a very usual thing. But the important thing is how one takes it. Though such things surely lead to distress and discomfort, the only way to get out of it is to be confident and act smart. This can help you lessen the pain you would feel. When faced with humiliation, a person undergoes several kinds of emotions and that makes them think of different things in their mind. Also one must never try to respond back strongly at that moment, as that can encourage them to do it more. We live in a society where people feel happy when one suffers, believe it or not but this the harsh truth which you must understand ASAP to get going. The only way to overcome such affairs is to be confident, act clever and do not take it personally. As per Robert J. Sternberg, a popular psychologist have researched on this topic and have drawn a few tips that help to handle such situations. The emotion that is triggered by the humiliation will be intense and sometimes will be intolerable making the other person weak and stressed. Being confident enough to face such situations with ease is the key mantra that can save you. Yes, there are times where you might have got totally dejected by being humiliated at work or in your own office environment. It might cause so much stress, as you don’t expect to be treated like that from your office people. In that kind of tough situations, try not to take it too personal and get emotional. Treat those stuff just as a discarded office file. You open it, it causes waste of time. This can be connected with harassment. The more you think about it, more you get stressed. When things go wrong and you face severe humiliation from your colleagues or your boss, It is natural to get offended and start cursing yourself for getting these kind of traps. Never even in mind also, underestimate your capability or your talent. Do not let yourself down in front of anyone. You are a person, who you project. So be confident during tough times. Never let your emotions or humiliation caused by people around disturb your work. People who have troubled you win the game, if you fail to do your duty. At the end of the day who wins the bread matters. So do not lose heart and keep your good work going. Even though there are people who keep on humiliating you, there are also people who respects you or at distance seem good to your eyes. Try to make contact with them and keep your social behavior very decent. This in turn will help you build a support pillar in office. It is a good thing, that you own a network to share your troubles. According to a recent survey, every single minute there are more than two serious humiliations that take place in this world. Keep it in mind you are not alone. Do not try hard to give a piece of advice or try to change people’s mentality. Behavioural change is not easy, that too in office you will have your own limitations. You can only control your mind or your behaviour. So, be yourself and keep yourself away from negativity. Facing humiliations every day then and there is not so easy to accept nor deal with it. And it is very challenging when it takes place in your own workplace. Remember just because time does not favour you now, it does not mean you will always be humiliated. Take every single thing as a lesson or an experience and move forward. Remember you will be respected and treated the way you treat yourself. So, even at tough times keep your head high, and never show your weakness to anyone. At the end of the day, every human being goes for a job to earn money. You cannot expect everyone to have polite behaviour. Accustom yourself and get fitted to the environment by being strong by nature. Both the genders who do not have a very good attitude have the same motivations towards humiliation. So, be ready to face the harassment and bullying issue and move on. Follow these simple tips to get over humiliation and to lead a successful career life as well as personal life.